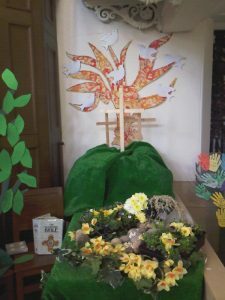 Easter began with an early Communion service, followed by a fairtrade breakfast. 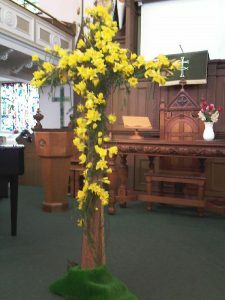 Then came the family service, which included an Easter baptism. 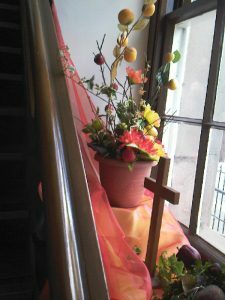 After hearing the story from John’s Gospel, we had an Easter quiz, and found we had a knowledgeable congregation this morning. 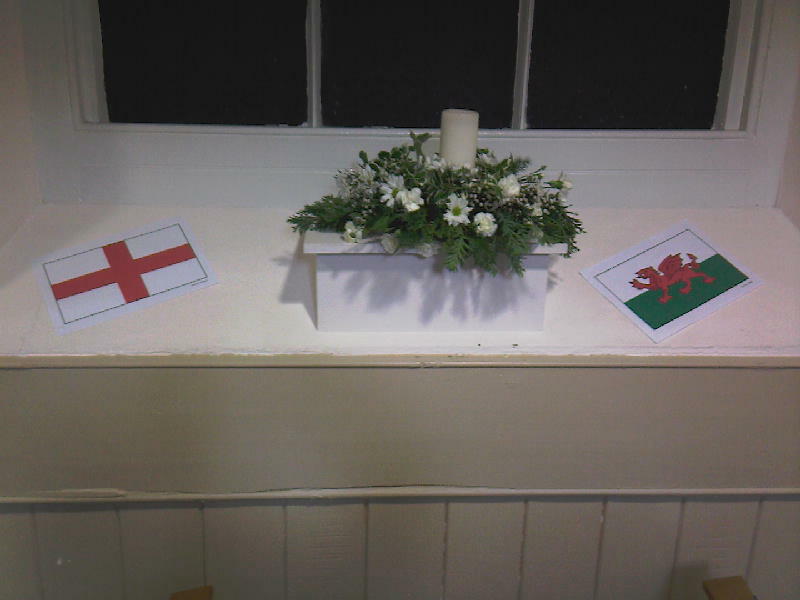 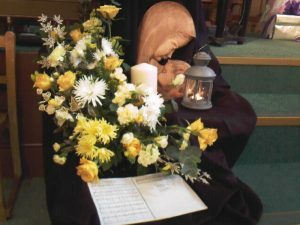 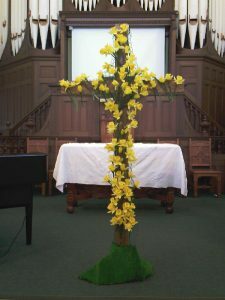 As part of our prayers for others, worshippers were invited to come forward with daffodils to place on the wooden cross. 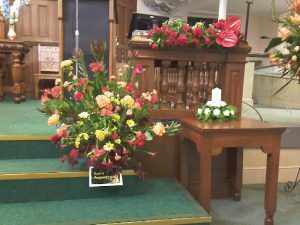 This was also the final service for our Minister, Revd Liz Blair. We wish her well in her future ministry. 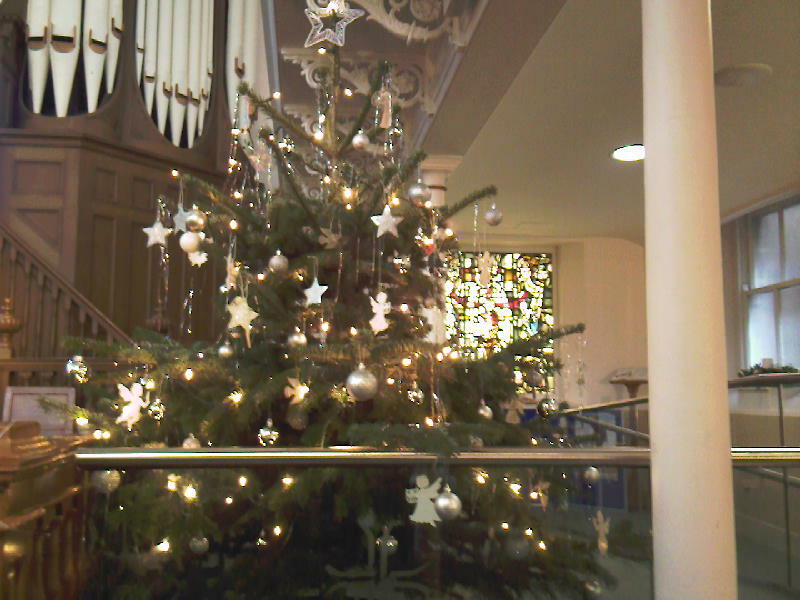 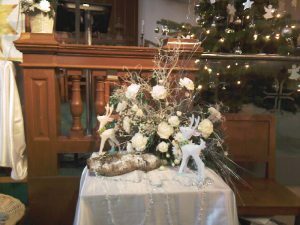 St Columba’s Church was again transformed for the Victorian Christmas Market weekend. 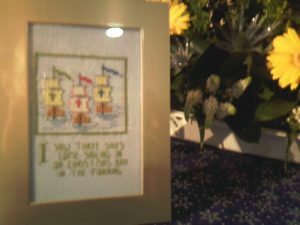 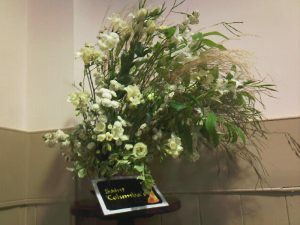 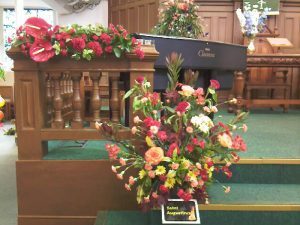 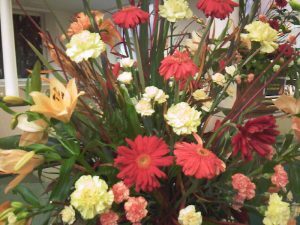 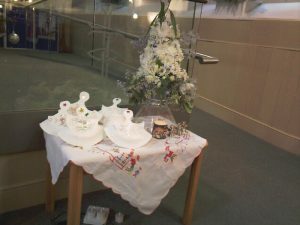 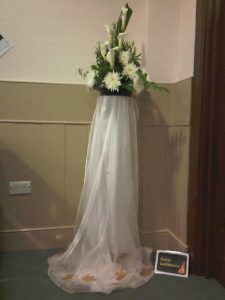 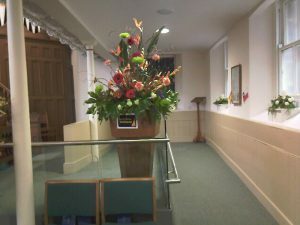 In conjunction with the town’s celebrations, market stalls, rides and displays in Northumberland Square, the church put on a floral display on a musical theme. 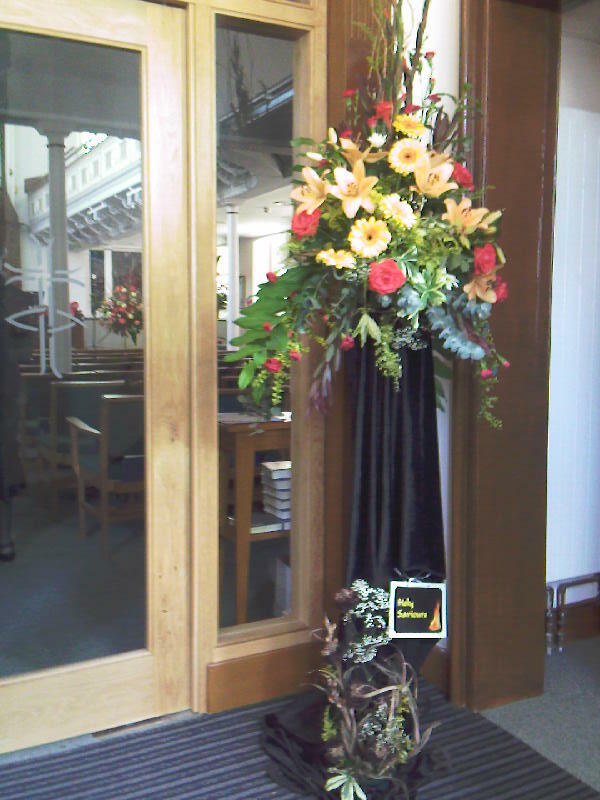 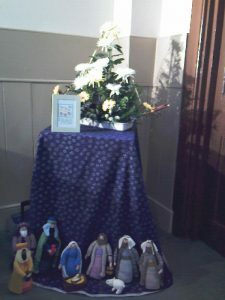 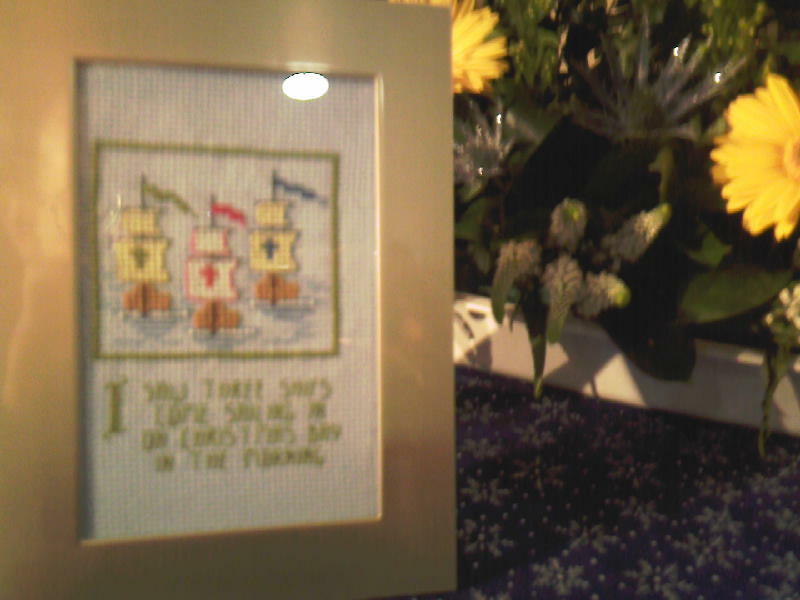 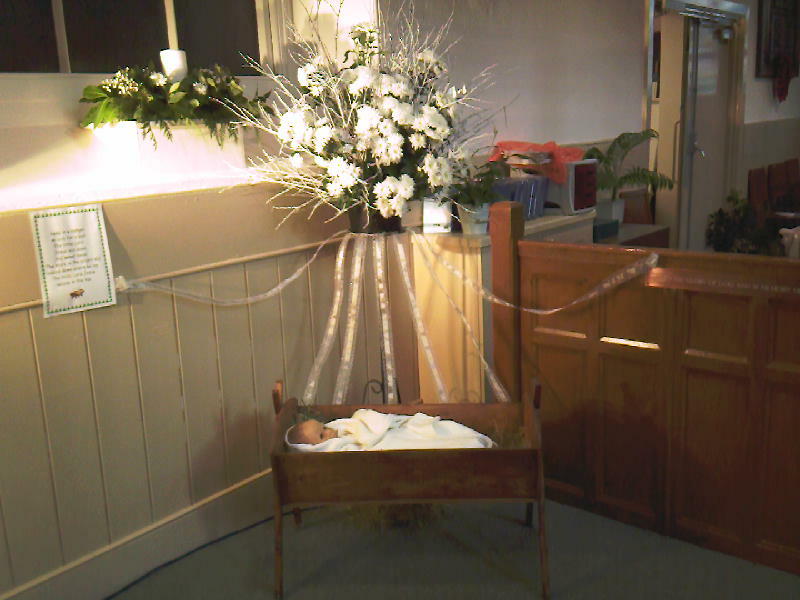 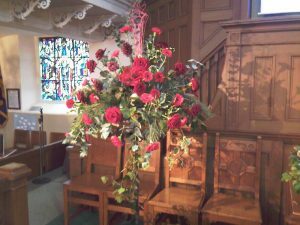 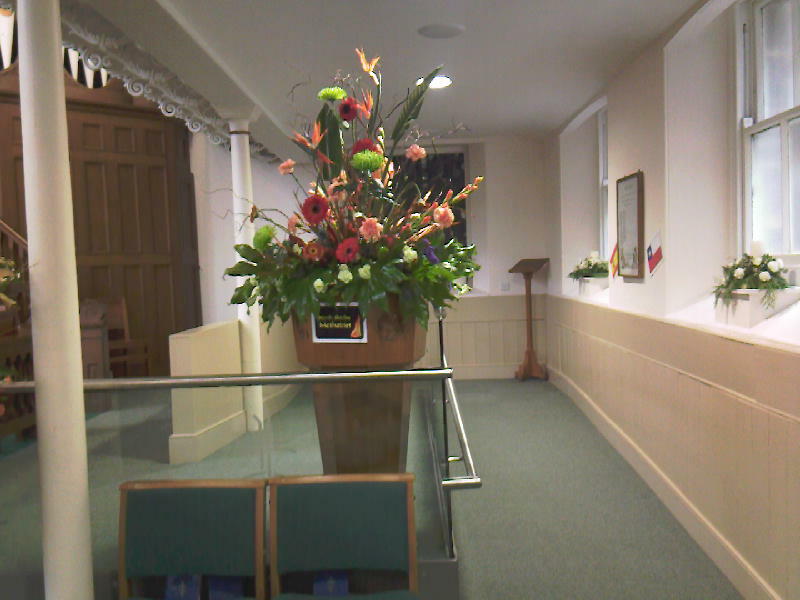 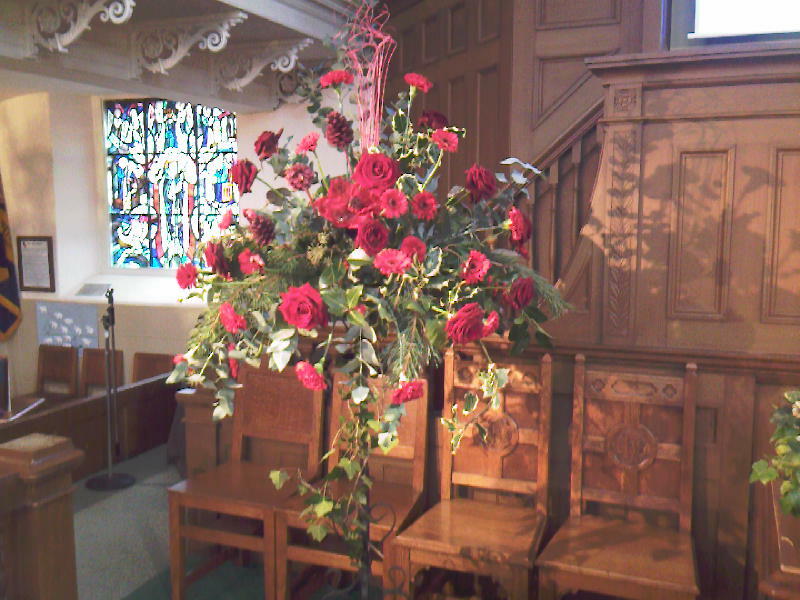 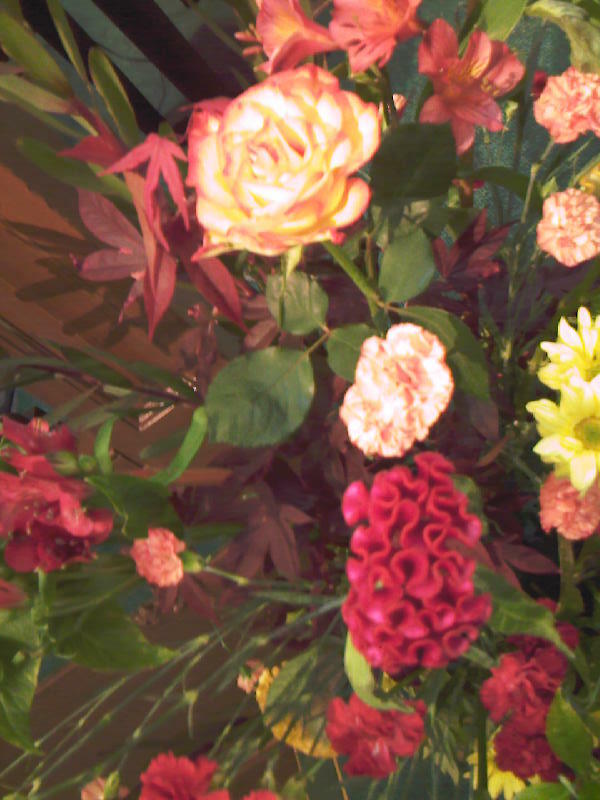 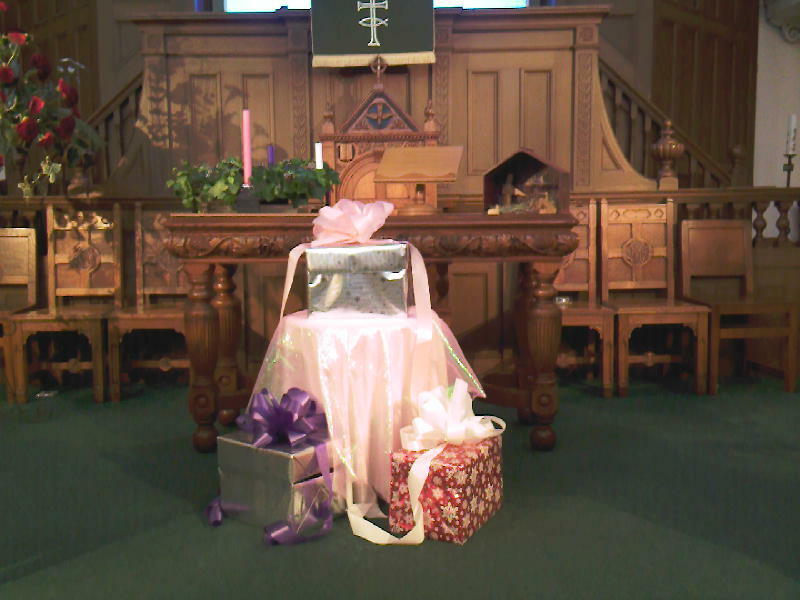 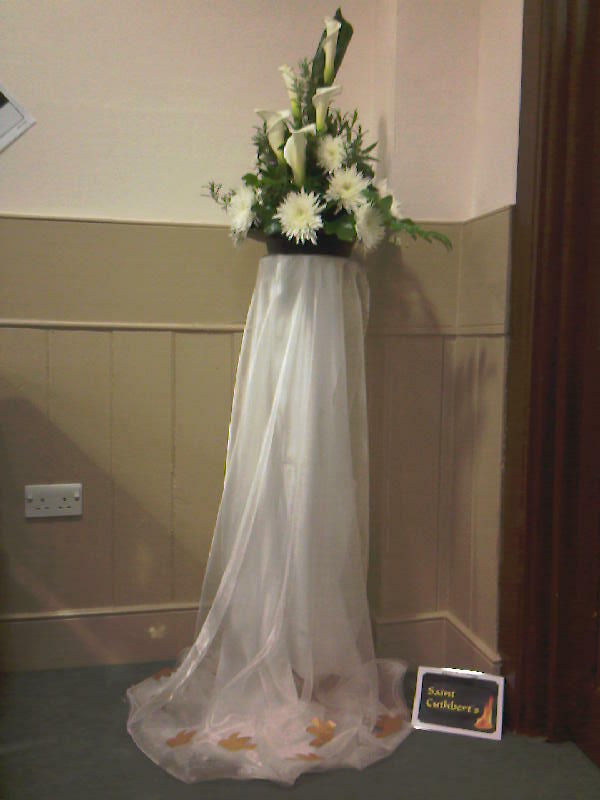 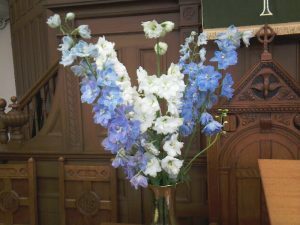 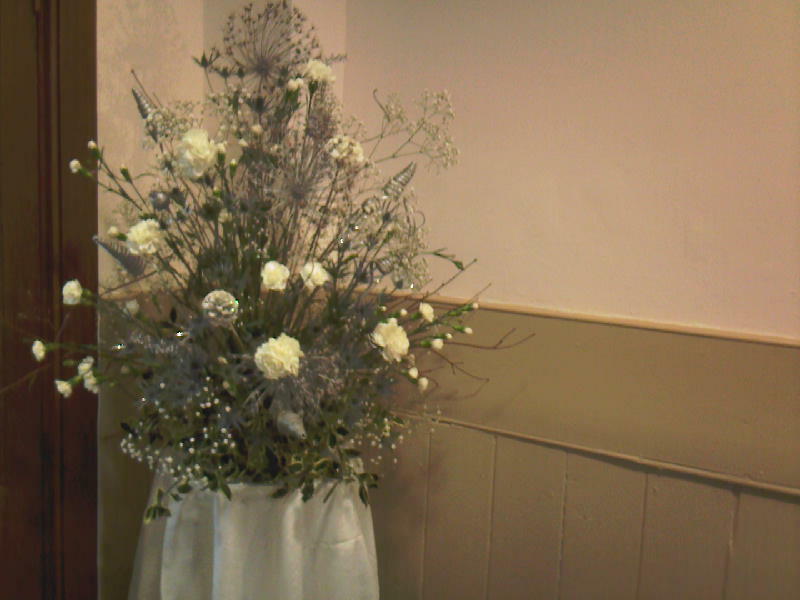 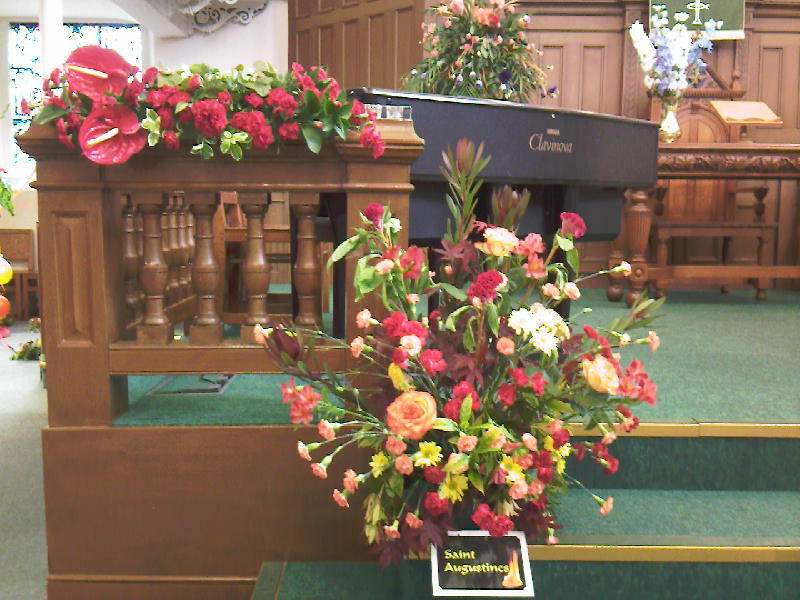 The church was open to visitors on Saturday and Sunday 11-12 December with flowers illustrating various Christmas carols. 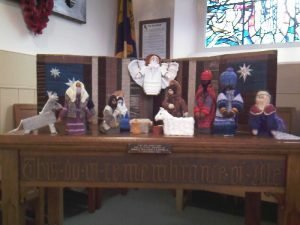 Displays included Away in a Manger, Like a Candle Flame, and I Saw Three Ships. 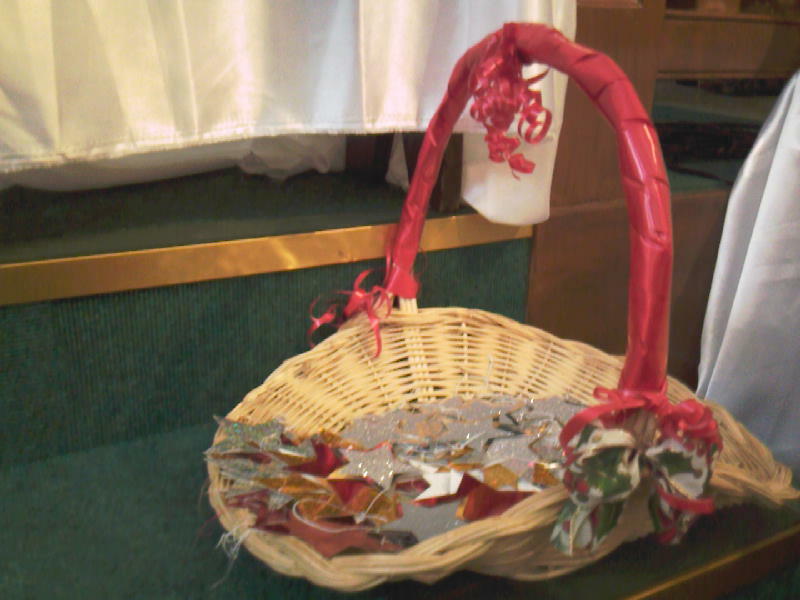 Visitors were also invited to write prayer requests on stars and place them in a basket. 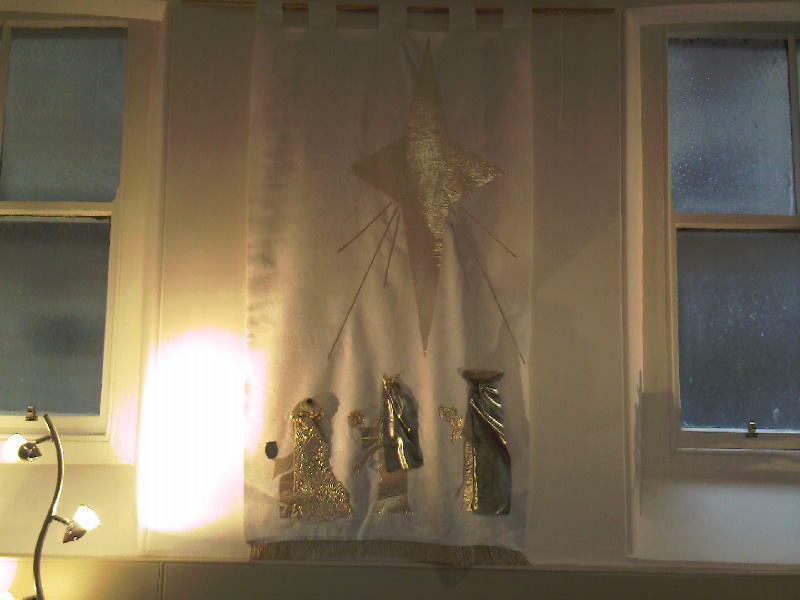 Prayers were later given to God, and the stars hung on the Christmas tree. 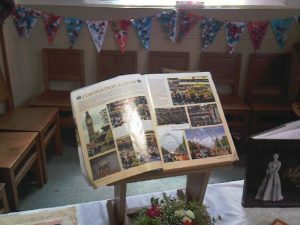 Hot and cold refreshments and stalls were provided in the church hall, as the last of this winter’s early snow melted outside. Sunday morning worship also picked up the theme, with the congregation joining in singing six Christmas carols, and witnessing a dramatic presentation based on Charles Dickens’ classic Victorian tale, A Christmas Carol. In three short acts, our Minister, Revd Liz Blair, was visited by Dorothy, Claire and Jenifer and reflected on stories from St Columba’s past and present and explored a vision for the future. 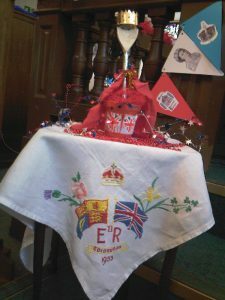 St Columba’s was the scene of a stunning Pentecost celebration. 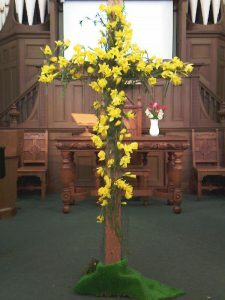 The Christian festival takes place 50 days after Easter, and commemorates the story of the coming of the Holy Spirit on the first disciples, and the beginning of the growth of the Church. 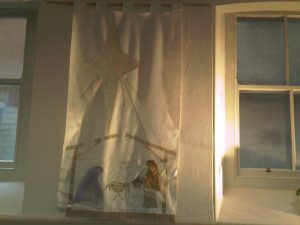 In the Bible, Acts chapter 2 tells how the disciples were gathered in a room in Jerusalem, when they experienced something like a rush of wind and fiery flames, after which they began to spread the Gospel in other languages. Two thousand years later, the Christian message is heard in every country in the world. 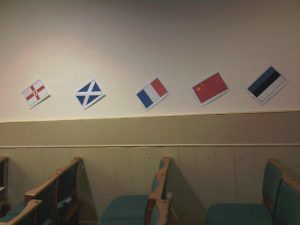 The culmination of the weekend of 22 and 23 May was a joint evening service, at which we were joined by fellow Christians from Churches Together in North Shields. 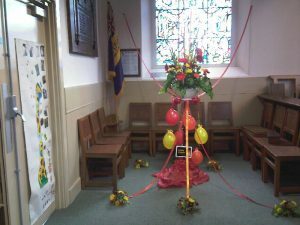 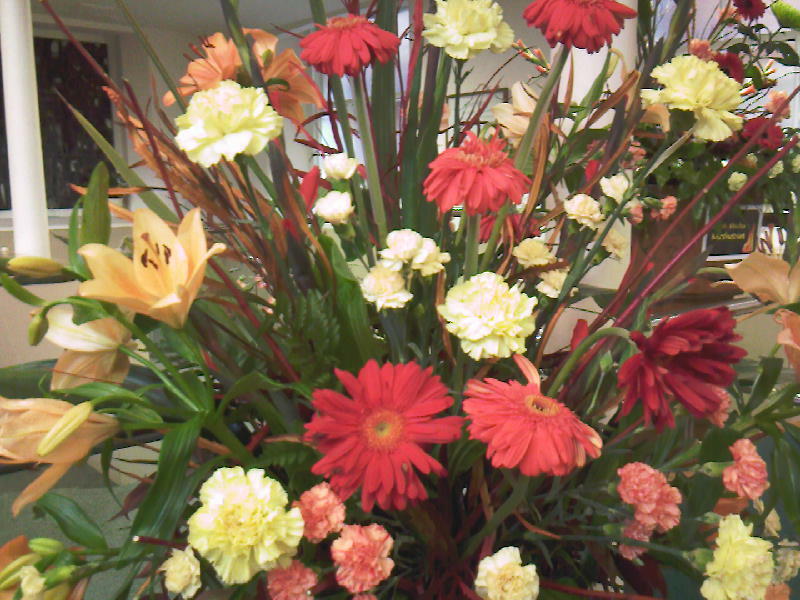 The church had been decorated with flowers arranged by several of the churches in the town. 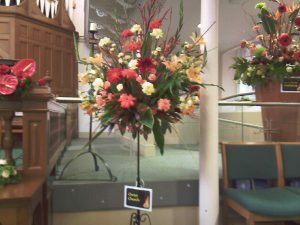 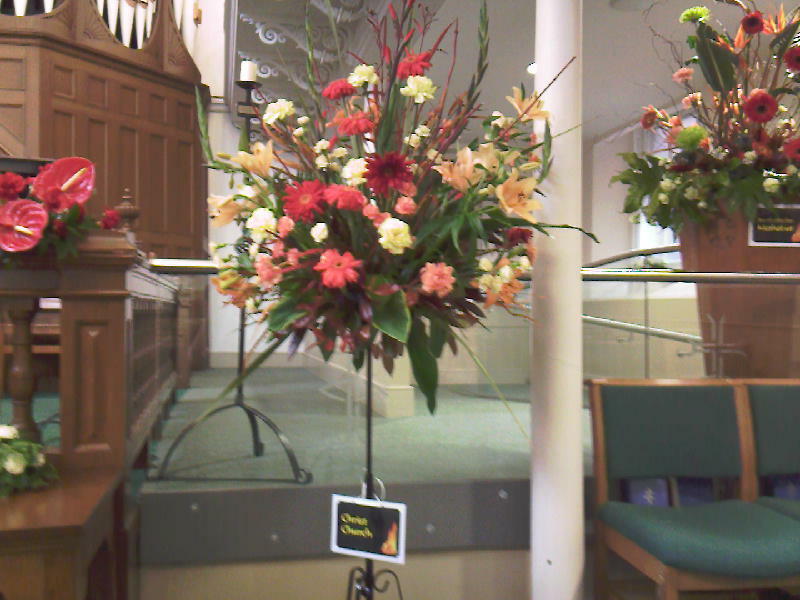 Displays included fiery reds and oranges as well as white of the dove of peace which is another popular representation of the Holy Spirit. The church was so full for the celebration service that we even had some worshippers in the gallery, and the singing, led by Stuart and Paul on organ and keyboard, was powerful. 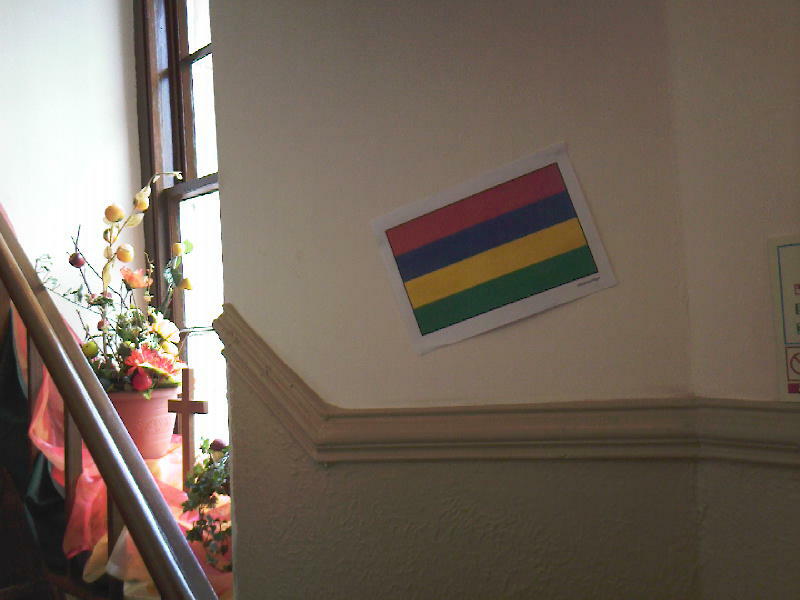 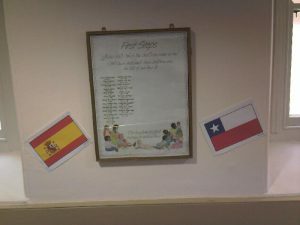 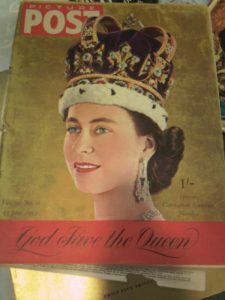 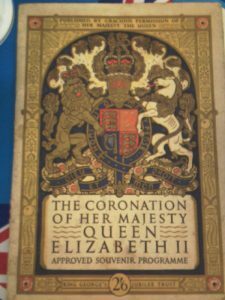 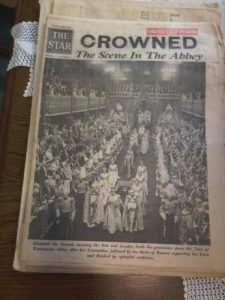 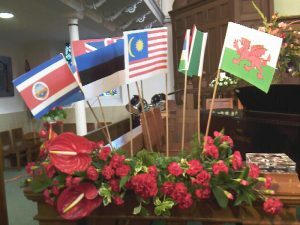 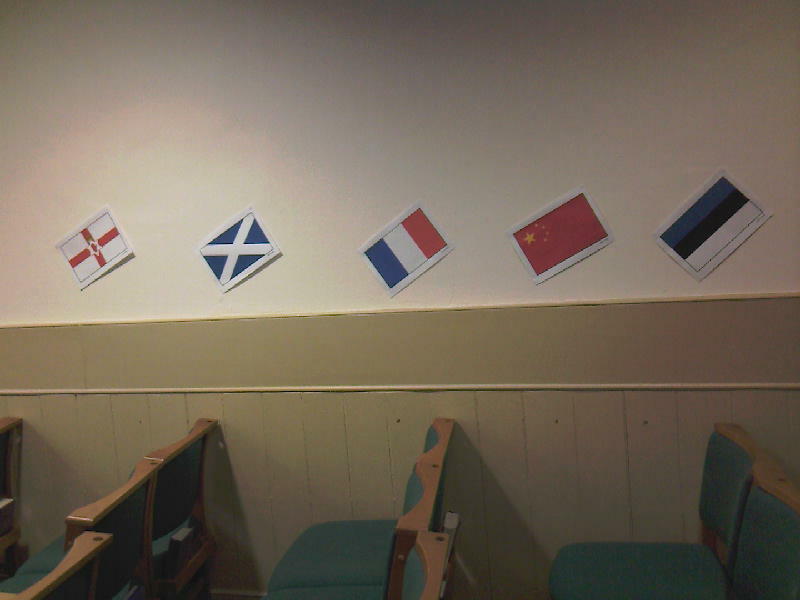 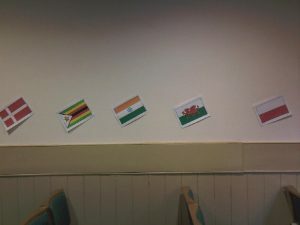 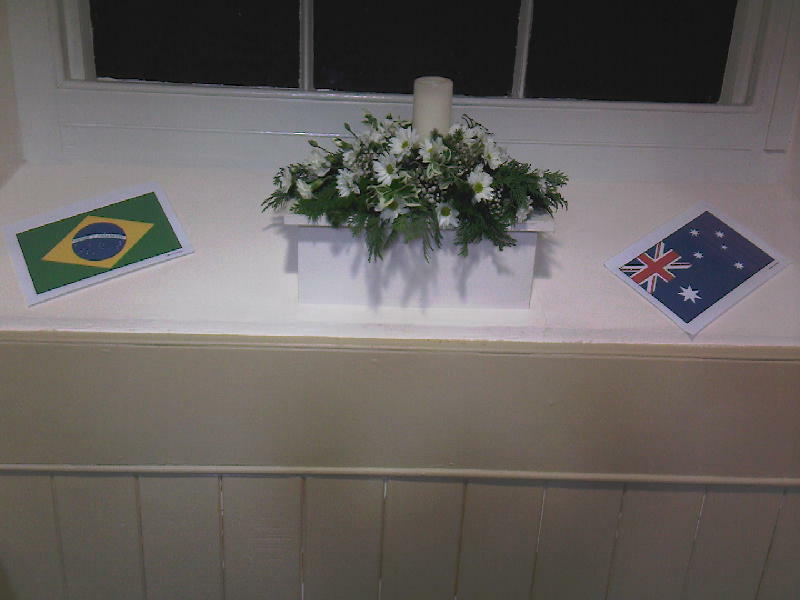 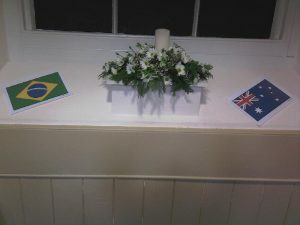 As part of the service, people from various churches who had been born in other countries, brought forward national flags from places as far afield as Malaysia, India, Mauritius, Zimbabwe, Estonia and Denmark, as well as Scotland, Wales and Northern Ireland. 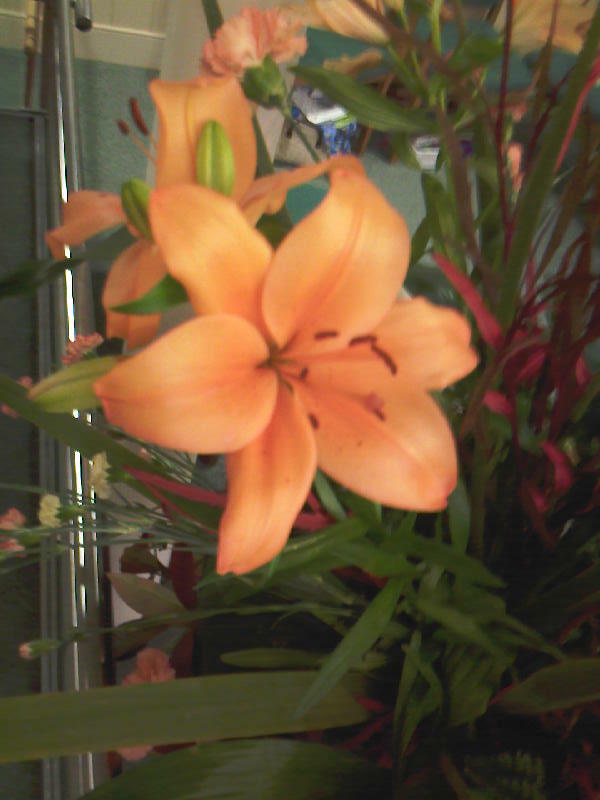 The procession was led by children, waving streamers of red and orange that they had made earlier. 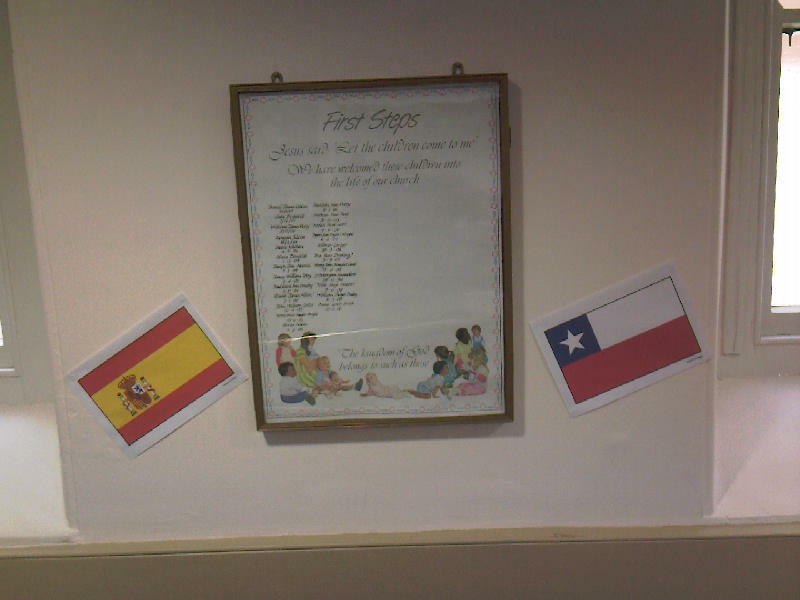 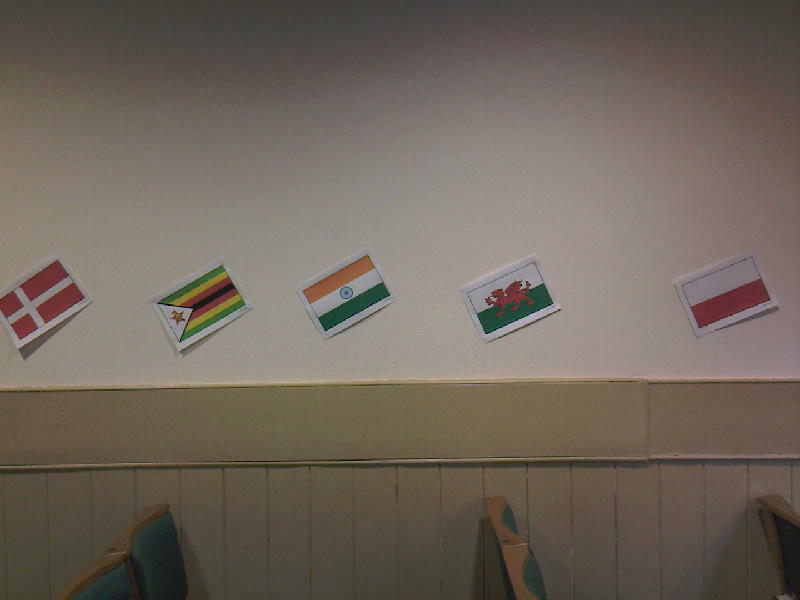 Later, we said the Lord’s Prayer together in many languages, and learnt a Shona worship song from Zimbabwe. 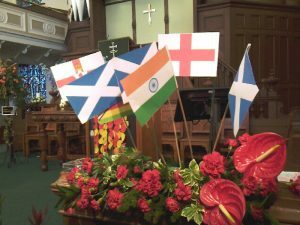 Our minister, Revd Liz Blair, led the service, explaining that although we came together from different churches and cultures, we were united by our faith in Jesus Christ. She went on to talk further about the Holy Spirit, reflecting on her own experience of God through her life, and pointing to the need to be open to listen and to change. 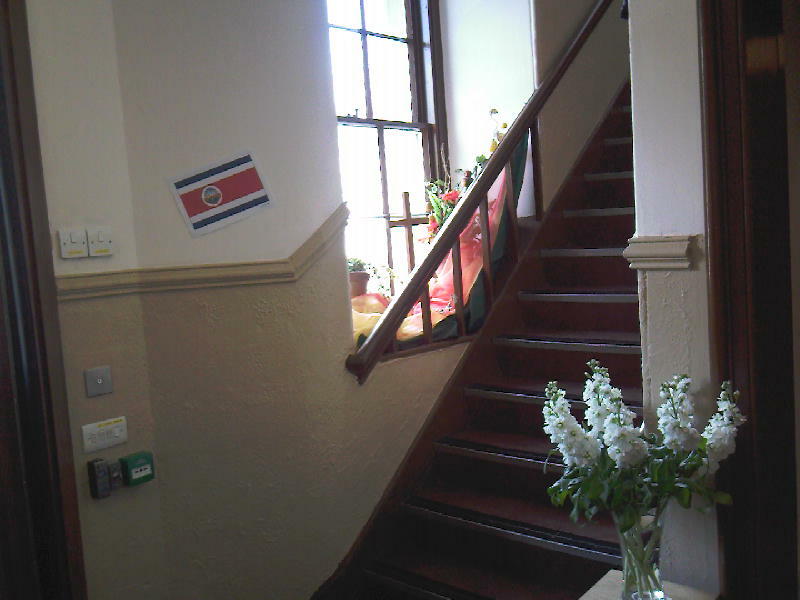 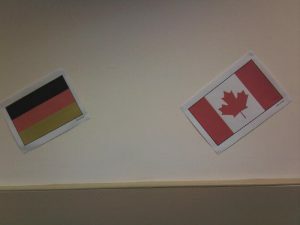 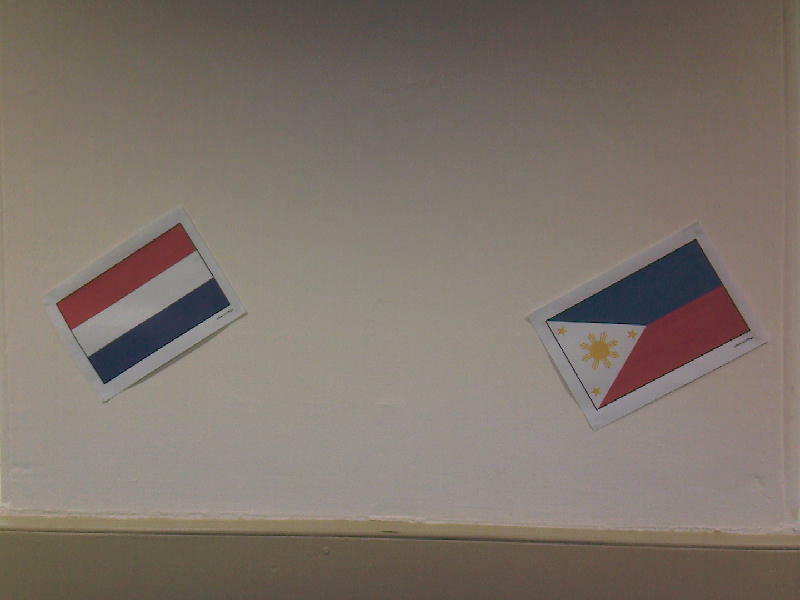 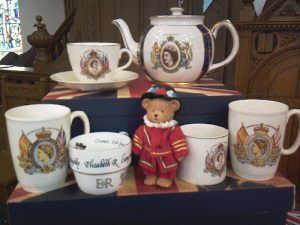 Old friendships were renewed, and new ones begun over coffee, tea, biscuits and birthday cake in the hall afterwards. 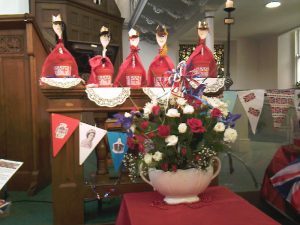 As Liz explained, Pentecost is in many ways the birthday of the church.